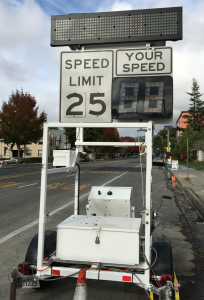 The Northern California Regional Intelligence Center (NRCIC), the fusion center for Northern California, has three trailers with automated license plate readers that it loans out to other agencies. The trailers are intended to look like speed limit warning signs that prominently display the speed of passing cars but are equipped with cameras that capture images of vehicles passing in both directions. The NCRIC is managed by the San Mateo County Sheriff’s Office, which handles requests for the trailers. The trailer picture was deployed in front of Willard Middle School in Berkeley in October 2015 after a series of attempted kidnappings. NCRIC has [redacted] portable ALPR trailers that look like speed signs and function that way as well, they are solar powered but if they can be placed near an alternate power source they will of course last longer than the average 5 at period, bottom line I they are available but very often loaned out to other agencies for similar reasons that you require one. Once approval is obtained on your end please let Sean O’Donnell or I know and we can enter your request on the NCRIC website for this equipment on your behalf etc, just let us know we’re here to help: Once approval is obtained as you mentioned, we can easily facilitate the placement of ALPR trailers with our NCRIC covert equipment crew, no problem. As of January 2016, NCRIC had three trailers, which are referred to as PIPS LPR Speed Trailer #1, PIPS LPR Speed Trailer #2, and PIPS LPR Speed Trailer #3. Requests for the ALPR trailers are submitted via NCRIC’s web site and then sent via email to NCRIC with the subject “NCHIDTA Equipment Request.” NCHIDTA is the abbreviation for Northern California High Intensity Drug Trafficking Area, which is also managed by the San Mateo County Sheriff’s Office. However, the information released by NCRIC did not include any information as to whether an ALPR trailer was actually deployed. For example, the National Park Service requested an ALPR trailer, but it was never deployed. The trailer can operate on battery power for up to 5 days and takes 24 hours to full recharge. There are four cameras in two housings that can capture images of vehicles and license plates coming towards the trailer and going away from the trailer. The cameras are manufactured by PIPS Technologies, which is now owned by 3M. The cameras are surrounded by infrared LEDs that operate in the infrared spectrum at 950nm . A Garmin GPS is used to provide the geographic location data (latitude and longitude) that is stored with each of the images captured by the cameras. The data is uploaded via a cellular data connection to the NCRIC’s ALPR data warehouse, which had 46.5 million records as of April 2015 (see Who’s watching who? : License plate readers used throughout San Mateo County).